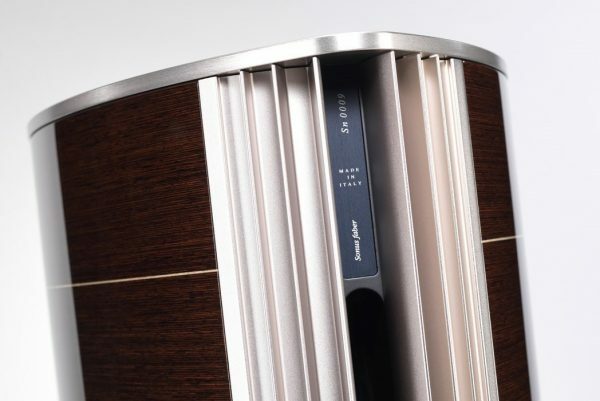 The Homage collection has been enriched with a new element that complements the family; Serafino, a floor speaker with a huge appeal and a surprising power to be explored. Once again, the name is taken from the history of Italian violin-making: Santo Serafino was a famous yet mysterious master who trained at the workshop of Nicolò Amati who worked in Venice in the first half of the 18th century and was specialized in making sturdy yet incredibly delicate violins. 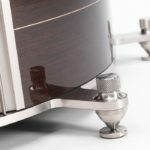 The violin shape of the speaker cabinets is also the fruit of careful research and major restyling. 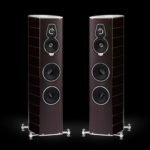 The curves of the sides change and double, blending the lines of previous Homage models with those inherited from Lilium and giving these speakers larger volumes especially on the back. 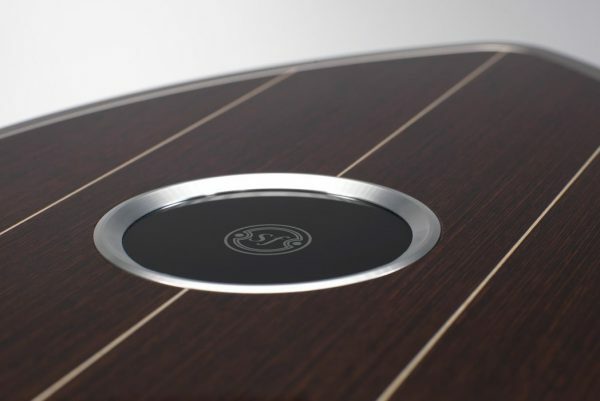 This evolution allows the cabinet to better control internal resonances. The top has as main accent, once again, the wood with the same finish of the sides. The brushed aluminum enhances the line and the “Sf” logo in silk-screened glass placed right at the center of the surface. The world of ancient shipyards and the tradition of Italy’s shipwrights are the essence of the inspiration of the design of the Tradition collection. 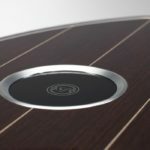 The new Wengè finish with maple inlays (a reference to the walnut finish of Olympica models) is the true aesthetic novelty of the collection and immediately links it with the elegant and timeless design of the most famous Italian motor-boats with their iconic wooden hulls. The aluminum is brushed with Titanium finish and the leather on the front features the new coffee color. The essence of the walnut wood is preserved in the traditional “Red” finish with brushed black aluminum and the leather of the black front in line with the finish of the flagship models Aida, Lilium and Il Cremonese. 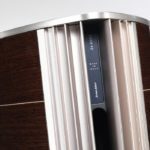 Visible and typical element of the novelties of the new collection is the back panel in extruded aluminum, the external part of the Stealth Ultraflex system characterized by a laminar tuning derived directly from the solution adopted in the Olympica collection.The outline of this part acts as a vent favoring the flow of air through the duct while controlling its speed and reducing any turbulence and hence distortion. The back too is part of the Exosqueleton system complete with Dampshelves on the top and on the bottom of the cabinet. 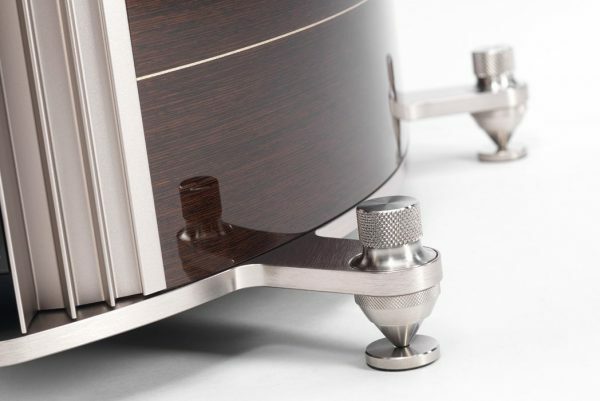 The speaker system is mechanically decoupled from the floor by the patented Z.V.T. system (Zero Vibration Transmission), optimized suspension system with alternating surfaces metal/elastomer/metal overlapped inside the bracket-spike group. 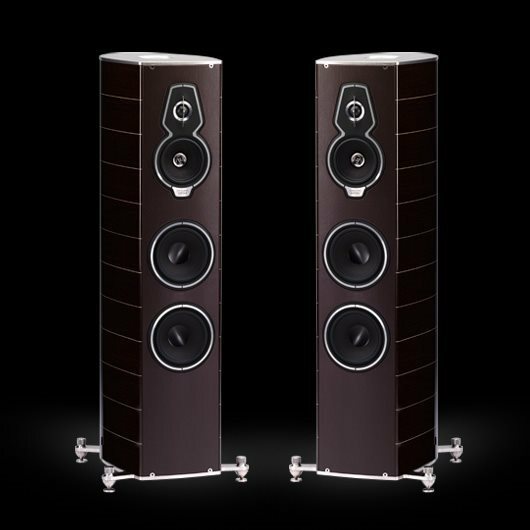 This system substantially reduces transmission of spurious vibrations to the listening room; also acoustic feedback phenomena are inhibited.